People tend to analyze Disneyland as a thematic treatment of America and American mythology – which is definitely an accurate reading – and the optimistic point of view is often characterized more as like a tone or even a flaw. But sitting here this morning listening to Put on your Sunday clothes (a song that plays on Main Street and about relentless aspiration) it’s occurring to me that perhaps even more than American mythology optimism itself IS the theme of Disneyland. It runs through every land and every attraction and is reflected back at us through various lenses (namely American, white, upper middle class lenses). In fact I think the general critique so often heard might be exactly backward: that the theme of Disneyland isn’t about America with an overly optimistic lens it’s about optimism with an overly American lens. And that its flaws (if they are to be considered flaws) come from that. Each land in the park reflects a distinct period of either history or culture where optimism and hope for a better tomorrow are at its zenith, at least from that lens. That IS the common thread. We enter Main Street USA right at the turn of the century – a period before the depression and before the World Wars where the marvels of technology are making life better on what seems a daily basis. Where steam trains carry us off onto exciting destinies, where everything is colorful and rosy, architecture is over the top, and people wear their Sunday best every day. People in this sleepy town coming into its own dream of the people they’ll be one day, the things they will achieve, the wondrous things that await them, and whadaya know at the far end of the street a shimmering castle beckons them forward towards their dreams – a symbol of things to come. At the hub a series of adventures await us – each a microcosm of the same story. In Adventureland a “untamed” jungle is awaiting man to conquer it, unveil it’s riches and/or unveil itself as the tropical paradise it was always meant to be. A similar story awaits in Frontierland where the promise of manifest destiny is new, gold awaits, and the horizon is limitless. In New Orleans Square it’s a party all the time and a reflection of the promise of the west, both a realization and one of the last stepping off points before the frontier. In Walt Disney World this theme is even better reflected as Liberty Square and revolutionary America is swapped in – another era in which fears and darkness are cast off in favor of a new vision of what a better tomorrow could look like. On the other side of the hub, a literal vision of tomorrow, Tomorrowland reflects what Main Street might look like in hundreds of years: technology has fulfilled it’s promise, no one wants for anything, the world and universe are at peace, convenience and leisure are everywhere, and all sorts of transportation are waiting to whisk you off to literally anywhere you please. And finally Fantasyland, usually the hardest land to fit into the “americana” interpretation, fits perhaps most with the optimistic and hopeful theme and is fittingly at the heart of the park. Here we see a land inhabited by characters with often terrible pasts, overcome them and achieve their dreams. Snow White and Dumbo overcome abuse and trauma. Peter Pan teaches children to fly, an archetypal metaphor, and hold onto their childhood. Mr. Toad has crazy fun with friends, Pinocchio and Geppetto get their wish and overcome heartache and fear and loneliness. Alice escapes the doldrums of victorian life, etc, etc. And off in the back corner of the park, which I’m sure if it had been designed from day one, would have laid straight back from the castle: the end of the yellow brick road as it were, lies a monument towards optimism, cooperation, and a better tomorrow again in the form of “it’s a small world.” It’s telling us that to achieve the dreams of the future it will take all of us uniting together. Disneyland and the Magic Kingdom therefore are really embodiments of the Disney ethos of their time: a strong conviction that the world is an exciting amazing place and no matter how bad things might have been or look to you now, a great big beautiful tomorrow lies just a dream away. And notably, that it’s up to us as a whole to take us there. The lands not only celebrate optimism but human achievements in realizing that optimism – whether it’s man conquering the jungle or frontier, the creation of a modern democracy, or characters escaping their haunting pasts. The park even tells us that death isn’t to be feared but enjoyed! (The haunted mansion). Perhaps it’s no surprise that these parks are more popular than ever before, given the world we find ourselves living in at the moment. The flaws in the park’s treatment then, aren’t the optimism itself, but rather the somewhat outdated, very white, very American, very classed stories it chooses to tell – particularly on the western side of the park (and perhaps with its historic coziness with monopolistic corporations as well) that were only optimistic and pleasant for the people who wrote the history. For the time they might have been appropriate given the audience they were designed for, but today some of the implications can make you a bit uneasy. I’d still hold that the bones are good, that those settings can still reflect themes of optimism while becoming more aware and inclusive, and indeed over time we’ve seen very slow changes to that effect. For example, Thunder Mountain – while initially perhaps a glorification of gold mining has over time with various story changes become more and more of a morality play about what happens to those who are reckless in their pursuit of profit – something a certain company might take a lesson from. I for one, as perhaps one of the more obvious examples, would love to see what a Disneyland would look like with stories of the immigrant experience of the same time period paralleling those on Main Street. At any rate, like America, Disneyland is flawed, but it’s themes are solid. Optimism, hope for the future, and the responsibility to foster that future, are the themes that lie at the heart of the stories it tells and why people keep coming back. P.S. This again reinforces the idea that I think Joe Rohde first articulated: that theme parks NEED themes in the literary sense to achieve their full potential and be effective: that that is what separates the good from the bad park executions, and Disneyland in particularly is a great example of what occurs when nearly every element of the experience serves to reinforce and drive home a particular message. 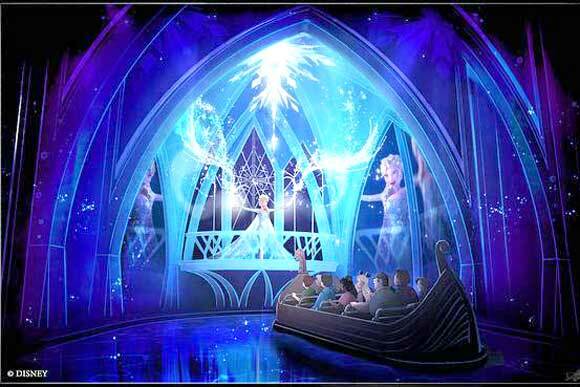 What’s your take on the frozen ride at epcot? I actually like the Frozen ride at Epcot, especially considering they had to adapt an existing ride track to a completely different kind of story. The animatronics are jaw-dropping, it does a good job at capturing some of the feelings and emotions and beats of the movie (and songs) while still being original enough to offer some novelty. In short, it gets right pretty much everything Mermaid gets wrong. There are some bits of weirdness since its an overlay. The backwards portion, and final drop are somewhat unmotivated and the lift hill being the “climb” to the mountain is a good idea that feels a little forced. And a viking longboat is probably not the vehicle you’d have chosen if you were designing from scratch. But those are pretty minor issues, what they deliver in a fun experience overshadows their lack of narrative necessity – perhaps largely because the bones of the previous ride layout beats were well constructed to begin with. And I love that they combined load and unload to give 2 new scenes, and that new scene post drop. Definitely a stroke of brilliance there. In short, it’s probably one of the best D tickets around. My issues with the attraction all come from a more aerial perspective. For starters it was downright idiotic to give a property as popular as Frozen to a ride with as limited a capacity and small a queue space as Maelstrom. That ride was designed as like a D ticket in the freaking 80s. Frozen could easily eat up the capacity of Universe of Energy and Flight of Passage combined for the next decade. So that was a dumb, shortsighted move presumably motivated by a desire to make it happen as fast and cheap as possible. Or perhaps it was brilliant move, factoring in what Epcot will look like in 2030. I don’t know if I want to give the company that much credit though. And speaking of that other elephant in the room, there’s the question of whether the ride belongs in Epcot at all. While the course of events that led to its placement in Epcot sort of make sense (it was the park most in need of a new addition at the time, and MK-the logical choice, needs an attendance boost like Joe Rohde needs a bigger earring.) from a creative standpoint it’s definitely problematic. I honestly don’t know where I stand. Thematically, it doesn’t belong in the Epcot of 1982. That was a park focused on adults, on the world, on real life, on culture, on humanity, on education and high-brow entertainment. But Disney has been running away from that Epcot since 1982, arguably even since Walt died, resulting in the schizophrenic park we have today. If Disney has recognized it doesn’t have the desire, or courage, to pursue that (which I think it finally has – the alternatives to reinforce the Disney brand as it stands today are just too tempting to the underlying business) then perhaps it has realized it’s better if Epcot was something different altogether. The Disney of today is a different company than of yesterday, focused much more on cultivating its brand through the use of specific properties and sub-brands rather than more vague ethereal notions of a certain type and quality of experience. Epcot transitions from being about the real world and the places within to the Disney world and the things that happen there. The countries within World Showcase are the backdrop for your own adventures with the characters that reside there or near there instead of being about the countries themselves. And futureworld instead of being about humanity’s optimism about the future and the faith in our ingenuity to solve the problems of the world, is again turned more into a backdrop of just “the future, technology, and such”. The structure of the park, once deeply embedded with its meaning becomes more of a plot device to tell the stories they want to tell. In some respects, perhaps this a better option, considering that the ideals of the original Epcot were always tainted by the pressures of the corporate influence that were necessary to get it built and stay operating. Although, ironically Disney is probably now better positioned than at any time in its past to create that original vision without need of corporate sponsors. And Disney’s current target audience is likely not nearly as interesting in edutainment, learning on vacation, or having a high-brow experience. I am, but I’m also the person that listens to a couple dozen hours of NPR a week and is currently reading Carl Jung. I’d argue that Disney (and theme parks in general) are shooting themselves in the foot in the long run by narrowing the audience they target to such a narrow range, are narrowing the world-changing potential of what themed entertainment can be, but god that is a discussion for another day. Anyway…. Frozen absolutely fits in that Epcot, the new one that is being developed before our eyes. With Ratatouille in France, Poppins in the UK, Aladdin in Morocco, Guardians of the Galaxy and Mission:Space in Futureworld – yes it totally fits. For better or worse, it’s the direction Epcot has been unconsciously headed in for a long, long time from the moment characters started meeting and greeting there. And given that it’s been happening unconsciously already, I’d much rather them start consciously shaping it that way so it’ll at least have the hand of a unifying voice again. So yeah that’s a lot more than you asked, but you asked me. Interactivity and Immersion and Storytelling.